A huge focus in today’s healthcare organizations is on the transmission of electronic images and communications to the point of care. While this is expected to result in improved operational efficiency and patient outcomes, many organizations face significant challenges in attempting to integrate or provide any level of connectivity among the numerous systems responsible for generating clinical data. 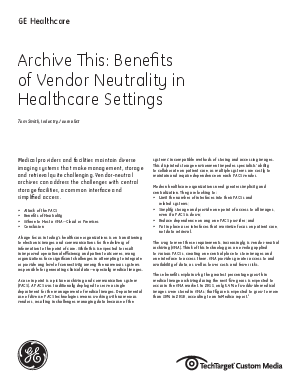 The way to meet these requirements, increasingly, is vendor-neutral archiving (VNA). Think of this technology as an overlay applied to various information systems, such as PACSs, creating one central place to store images and one interface to access them. VNA provides greater access to and availability of data, as well as lower costs and fewer risks. This whitepaper explores this technology in greater detail.